My relationship with London is not so much love/hate as hate/indifference. I don’t like how everyone is busy all of the time, and whatever they’re doing is certainly more important than what you’re doing, and God help you if you’re in their way. I’m not always sure I like the personality of the city either, which seems to be a cross between a corporate machine and a stereotype. But there’s no denying that London is still a great cultural centre. There’s so much going on all the time that to go and not take some of it in would be a real shame. 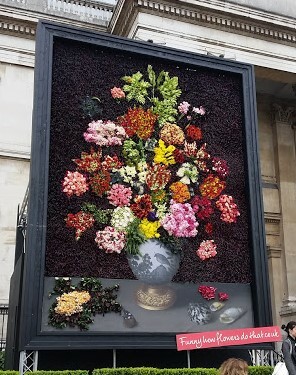 Chances are that every tourist will go to Trafalgar Square at some point, and once there you might as well visit The National Gallery. Yesterday I was waiting to meet my mum and had an hour to kill, and there are worse ways to spend your time. So in I went. With big galleries like this I always find it’s better to stick to certain sections that you have prioritised, so I decided to look at the special exhibitions. Both were free. The first was Dutch Flowers which, unsurprisingly, looked at Dutch paintings of flowers in vases painted in the 17th and 18th centuries. If that doesn’t sound like your cup of tea I didn’t think it would be mine either, and I wouldn’t have any of the paintings handing in my living room. But together in this small room, I was surprised at the diversity that could be found in this subject. Each vase had a different mood – some full of joy, some reminiscent of death, some of triumph. All masterfully painted, of course. It’s a small room and if you’re there, worth popping into. Much more interesting to me, though, was the Associate Artist exhibition My Back to Nature by George Shaw. Allowed to work with the gallery’s collection for 2 years, he has created a series of modern responses to the classical image of woodland revelries, such as that below. A tree full of beer cans, a sheet hanging from a branch – the suggestion that far from being idylls of peace, what is really going on in these forests is much more mysterious – a sense heightened by Shaw’s use of religious imagery. I’d recommend stopping by this room for a refreshingly modern take on things. 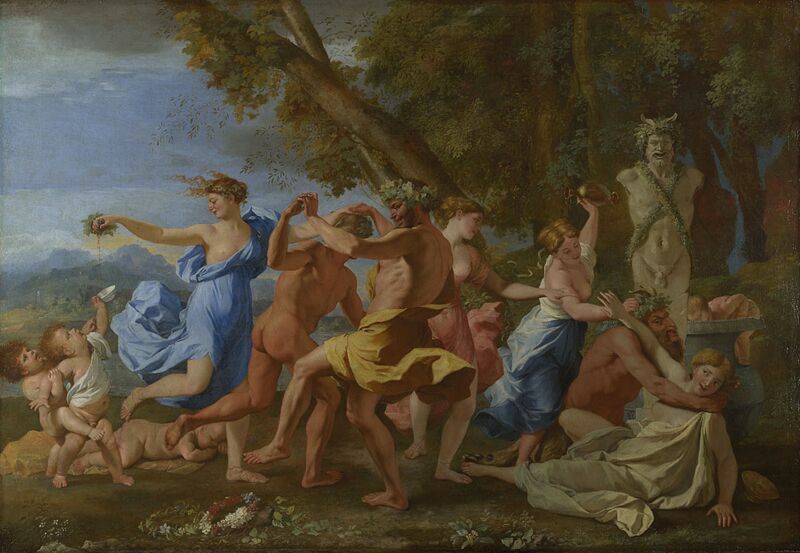 Poussin’s A Bacchanalian Revel before a Term, 1631-2. Courtesy of the National Gallery. Having a little time spare I also stopped by the Impressionist room (i.e the point at which French art starts to get interesting). Some of these paintings I have seen so many times in publications that they seem like old friends, but some of them still get me every time. The wildness of Van Gogh will never cease to move me. It reminds me of why, though it might not all be to your taste, we’re lucky to have places like The National Gallery. This entry was posted in Exhibitions, On my travels and tagged art, classical, impressionism, London, National Gallery, painting. Bookmark the permalink.